Between now and 2030 worldwide demand growth for milk and milk products will be three times the level of current US milk production. This was one of the main findings of the latest publication, from the IFCN – the Dairy Research Network – discussed at the 19th IFCN Dairy Conference, held at Teagasc, Moorepark, Cork in Ireland. The short-term IFCN Outlook points towards a continuing increase in milk supply worldwide. In 2017 world milk production grew by nearly 4%, which is significantly higher than the growth level achieved in 2016. However, growth has started to slow down significantly in 2018. Key factors in the slower growth in 2018 are climate anomalies in New Zealand, the EU and Argentina and a challenging economic situation for dairy farmers in the United States. For the second half of 2018, IFCN expect supply and demand growth to be more aligned, with an expected world milk price level of 35-37 USD / per 100 kg, or 30-32 EUR per 100 kg, 6.4 -6.7 per NZD per kg solid, 15-16 USD/cwt. 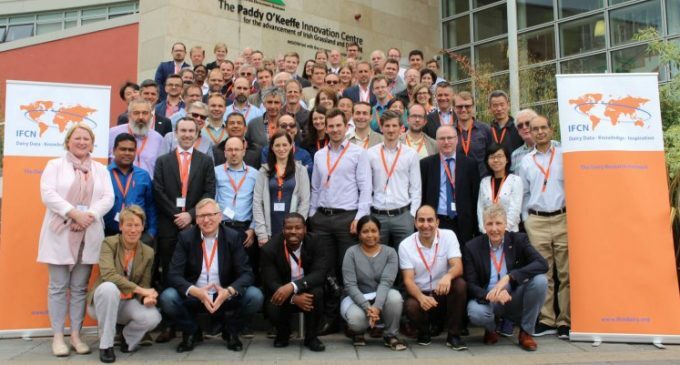 International delegates attending the recent IFCN meeting in Teagasc Moorepark, accompanied by Dr Fiona Thorne, Teagasc economist.